The M17x R4 carries on in a chassis that resembles the one used in the Alienware M17X ($2,254 direct, 4.5 stars) and the larger Alienware M18x ($4,529 direct, 4 stars). Like the previous models, the M17x R4 has modern retro styling that grabs your attention. The system's grilles and lighting evoke a modern reinterpretation of a 1950s hot rod. There are multiple lighting zones, which can be controlled with Alienware's Command Center software. Alienware calls it AlienFX, and you can use it to change the colors on the backlit keyboard, touchpad, Alienware logo below the screen, Alien head/power button, and the grilles on the front of the system. Advanced themes will cycle the colors, so you're assured that you'll know which system is yours in a darkened room. It's not subtle, but do you really want subtle when you're planning to crush your enemies on the game grid? The proof, as they say, is in the pudding, and this is some pudding. The M17x R4 rivals in performance other gaming laptops with dual graphics, thanks to its Ivy Bridge based Intel Core i7 processor and Nvidia GeForce GT 680M graphics. Games were playable at both quality settings, including Crysis at medium settings (98 frames per second, or fps), and Lost Planet 2 at medium settings (159fps) and high settings (77fps). Crysis at very high settings was just short of smoothly playable (38fps), but gaming rigs need two graphics cards to play at that setting (so far). That said, you should be able to tweak the 3D settings for Crysis and play smoothly at the system's 1,920-by-1,080 native resolution. You'll need to spend a lot more money for just a bit more performance in the Alienware M18x (71fps) and the Eurocom Leopard 2.0 ($3,606 direct, 4 stars) (76fps). For most people short of the independently wealthy, it's not a good tradeoff. The M17x R4 is also one of the best-performing systems we've seen on the multimedia benchmark tests. The system ran the Handbrake video encode test in 1 minute 12 seconds, and the Photoshop CS5 test in 3:03. To put this in perspective, high-end gaming desktops must put in a lot of effort to achieve these times without burning out, and desktops don't have to worry about laptop-style cooling concerns. The M17x R4's 32GB mSATA cache drive, Turbo Boost Core i7 processor, speedy DDR3 memory, and 7,200rpm primary drive all contribute to the system's speedy performance. The M17x R4's Photoshop CS5, Handbrake, and CineBench R11.5 (6.86) scores all topped our charts. The one performance metric where the M17x R4 came up short was in battery life. While it's true that you wouldn't ever want to put the M17x R4 on an airplane tray, the system's battery life of 2 hours 36 minutes lagged the competition. You'll want a system like the MSI GT70 0NC-011US ($1,999.99 direct, 4 stars) (5:29) or the previous midrange gaming EC MSI GT783-625US ($2,599.99 direct, 4 stars) (3:29) if you need battery life and gaming prowess. 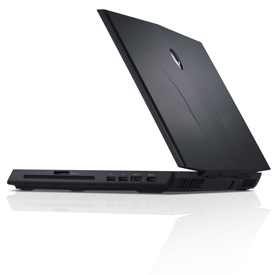 Alienware M17x R4 Laptop have an aggressive style along with audacious lighting. Features such as 2.6 GHz Core i7-3720 chip, 500GB HDD, 32GB mSATA SSD, and 28nm Nvidia GeForce GTX 680M graphics card, 17.3 inches display. I played Just Cause 2 with 79 fps at full HD resolution.